Book Now & Save 15%! 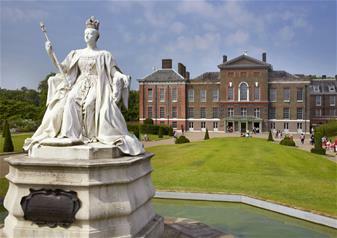 A residence of the Royal Family since the 17th century, Kensington Palace is the official London home of Prince William and the Duchess of Cambridge and you’ll get the chance to venture behind the royal doors! You’ll arrive at the Palace through beautiful landscaped gardens before stepping through the entrance hall and into the plush King and Queen’s State Apartments. Here, you can soak in exceptional architecture and costumes that the royal family have worn over the centuries. Discover the story of the Stuarts and the Hanoverians royal courts, and find out what you would have worn and how you should behave and act in order to succeed in the palace’s heady environment! Designed by Sir Christopher Wren, the architect behind St Paul’s Cathedral, Kensington Palace is an elaborate palace with much to see and discover. This temporary exhibition gives you a fascinating insight into the private character of Queen Victoria. This display shows how she harnessed the new age of photography to project an image of Imperial power across continents and document the minutia of family life. Have the extra special chance to discover what Victoria’s days were like as a Princess including her education with fascinating objects unveiling her early years. Such items include a scrapbook that was created by her governess, Baroness Lehzen. This exhibition deep dives into young Victoria like never before. Worth the time to see inside the Palace and learn more about the Royal family. Princess Diana's Fashion Story - great exhibit.